"Labor actually started on Monday night, however, I didn’t realize that’s what it was at the time. About 10:00pm Monday, July 24th, I had my first contraction. I didn’t think much of it because at this time in the pregnancy one expects contractions. They were fairly consistent throughout the night and early morning; coming about every 25 minutes or so. I was up most of the night wondering whether or not actually in labor, or just dehydrated (since dehydration can cause false labor). Then at about 3:00am I got up and drank sever bottles of water and they seemed to die down some. It seemed to me that dehydration was causing them so I decided that I was going to sleep. I had a doctor’s appointment in the morning so I would know more then. When I woke up that morning I was feeling great. The contractions seemed to be gone and all I felt was a little nauseous. I went to my appointment at 11:50am and when Dr. Dhaliwal checked me, she said I had progressed from 1cm (the previous week) to 2cm. Not significant progress but I was at least relieved to know that labor hadn’t started. She then stretched my cervix as much as she could and that put me at about a 2 ½. I asked if she could give me any type of estimation on when I might have the baby and she said no. She would guess that the stretching would definitely help things along and that I was probably not going to make it to my next appointment, but she couldn’t say for sure. Before I left she told me I could expect cramping due to the stretching of my cervix and possibly some bleeding. She reminded me that if the bleeding was excessive, water broke or the contractions were coming 5 minutes apart for a half an hour, I was to come in immediately. I called Tommy and Jeff to let them know what Dr. Dhaliwal had to say. I wasn’t feeling like labor was going to happen at all soon; after all, the contractions were all but gone at this point. I was still feeling nauseous but I had been unable to eat or drink anything since 6pm the day before (and it was now almost 1:00pm) so it wasn’t that unusual to be sick. I told Tommy that I didn’t feel it would happen THAT soon but maybe they should think about coming out Thursday or Friday of that week….just in case. He said he would speak to Jeff and call me back. I went on with my day and the contractions kept coming but only every 20-30 minutes at this point. I still didn’t think anything of it because the Dr. had told me to expect it and I figured the dehydration was still a contributing factor. (denial?) I tried going in the pool and drinking some water to see if that would stop the cramping and nausea but it wasn’t helping. I tried to sleep it off but that didn’t work either. The contractions were still coming and they were getting closer together but still not regular or painful (so I still thought dehydration). It was about 3:45pm when I decided to go in the pool again. A friend, Heath, (actually, one of the fathers from my first surrogate) called and after talking to me for a few minutes, he decided that I was definitely in labor and that I needed to call Tommy and Jeff and have them come out immediately. I assured him that I was only feeling dehydrated (could I be any more lame??) and feeling nauseous, not in labor. He ‘assured’ me that after having been through 2 other labors with me he could tell by my voice that I was most definitely in labor. He reminded me that once I get past 4 centimeters I go extremely quick and I needed to go to the hospital. After arguing with him for a minute or two he very adamantly told me that I was no doubt in labor and that by 11:00pm that baby was going to be here. I was to call Tommy and Jeff and have them get out here as fast as they could. And, he said, I had no choice in the matter. :o) So, I finally agreed that maybe, possibly, I could in a little way be in labor and I immediately called Tommy. Unfortunately he informed me that the first flight out wasn’t until 7:00am (EST) the following morning and there was no way they could get here any sooner than that. This meant they would not be able to get to us until about 2:00pm (PST) the next day. Well, I felt this was unacceptable; they HAD to be here for the birth. I tried to reassure him that I was not in full blown labor (still in denial here) and that I would hold on as long as I could. (like I have control???) I was going to hang out at the house still since the contractions were still not quite consistent (denial) and still not at all painful (denial). And if I did have to go to the hospital I would ask for an epidural so that it might possibly slow the labor down. I continued trying to rest the contractions away. (denial) I thought maybe if I took a nap they would magically be gone when I woke up. This, however, wasn’t the case. I did lay down to sleep but the contractions kept coming AND they were getting closer together. They were at about 10-15 min apart by the time Jeff (my support person) got home. We discussed whether or not I should go in since they were coming so often now. Still being in denial I said I would not go in until they were 5 minutes apart for 30 minutes, just like the Dr. told me. So, we talked and waited and they kept getting closer. I had Jeff start really timing them and finally at about 7:30pm they were about 5 minutes apart and had been for quite some time. I called Tommy and explained that I was going to go into the hospital. The contractions were now about 4-5 minutes apart and even though they were still not painful (could be dehydration???) I wanted to be at the hospital just in case it was labor. I still tried to assure Tommy and Jeff that I would do everything in my power to make sure they could make it for the birth, however at this point I knew in my heart that it would not happen. But I stayed in denial for quite some time still. Jeff, Holden and I got to the hospital about 8:30pm and made our way up to the maternity floor. On the car ride over I was timing my contractions and at this point they were 2 minutes apart. Of course I wasn’t going to believe that. I still wanted to believe that the boys would make it. Maybe the epidural would slow labor down enough?? And there was still hope that I was just dehydrated??? The nurses had me fill out some paperwork and then brought me back to an examination room. They made Holden and Jeff waited in the waiting room so, still not being in pain, I said a cheerful good-bye and was off to the room with the nurse. I changed into the lovely gown they had waiting for me and got into bed. They hooked me up to the monitors and let them run for a while. When the nurse came back she asked if I knew that my contractions were coming 2 minutes apart. I said yes and brought up the dehydration. (denial) I felt that if I was in true labor the contractions would be much more painful at this point. She agreed that it could possibly be the case but she would check me to see if I had progressed since my dr. appointment this morning. Well I was at a 2-2 ½cm this morning and now when the nurse checked me I was at a 4-5cm. I was no longer able to deny that I was in labor. And since I was passed 4cm I was going to go quickly and there was no way Tommy and Jeff were going to get here. I was SO incredibly sad for them. At this point (about 9:15pm) the contractions were getting painful. When I came in I told the nurse they were about a 3 or 4 on the pain scale and now they were about a 7 or 8. I asked for an epidural and she said that after we were done with the paperwork (about a 20-30min) she would take me to my room and get that started. I was extremely disappointed because since I was already at a 4-5, I knew I would go too fast to be able to get the epidural; and that meant the labor wouldn’t slow down at all and there was no hope what-so-ever the boys would get here in time. Denial was completely gone and I had to accept they wouldn’t be here. Again, I was devastated for them. I really wanted them to have this experience. About 9:45pm they walked me to my room and now the contractions were coming about 30sec-1min apart and they were about a 9 or 10 on the pain scale. Along the way we had to stop when I had a contraction because they hurt so bad. We got to the room and they hooked me up to the monitors again. I was advised that they would have to monitor the baby for at least 20 minutes before they could give me any type of medication. I was in so much pain by now that I could hardly stand it. They let Jeff and Holden into the room and, not having seen me in about an hour, they expected I would be the same cheerful person I was when I had left them. Sadly, they were mistaken. I had progressed to 7-8cm and was in so much pain that I could hardly talk. My poor son Holden saw me have my first contraction and he had to leave the room. Jeff went out with Holden and updated everyone on my progress. When he came back I was in so much pain all I could really do was moan. The nurse agreed to give me Nubain ‘pain medication’. Ok, this is not pain medication. This is a drug that is suppose to relax you during and in between contraction so it doesn’t actually help. It did relax me in between the first 3 contractions after they gave it to me but then the contractions stopped ending and became one long contraction so there was no ‘in between’ in which to be relaxed. I remember hearing the phone ringing at some point but don’t know what time it was. It was Tommy and Jeff calling to see what was going on. The nurse had suggested they stay on the phone so that at least they could be here in that way. What a wonderful idea! I was so happy they could share the experience in some way. I tried to talk to them at some point but was in too much pain to talk for long so I handed the phone back to Jeff who held it through the rest of the labor and delivery and a while afterwards too. At one point my ex-husband, Jim, came in to support me as well. Unfortunately for him he entered the room to a full spread-eagle pose as I was in the middle of trying to push so that my water would finally break. After he recovered from that site I know he fanned me while Jeff did the play-by-play with the boys on the phone. At about 10:20pm(ish) the nurse advised me that Carrigan was still pretty high but I had progressed to 10cm and the doctor would be called. My bag of water still hadn’t broke so they were waiting for the doctor to break it. After that, she said, things would go quickly. I was in excruciating pain and ‘things would go quickly’ wasn’t what I wanted to hear. I wanted to hear that things would go NOW. :o) So, we waited for Dr. Dhaliwal and all the while I was pushing as much as I could to try and break my water so she would just come out. I looked like some kind of fool doing some weird yoga/gymnastics or something the way I was moving around trying to find a comfortable position. (a comfortable position in labor?? what was I thinking??) We were also waiting for Heath who was trying to get there to video tape everything so Tommy and Jeff would be able to see a little of what was going on. Both Heath and Dr. Dhaliwal got to the room at about the same time. Heath fumbled with trying to put the battery into his camcorder and the Dr. suited up. Once everything was in place she broke my water and WOW, how wonderful that felt! Now it was up to me to push little Carrigan out. So, with the help of Dr. Dhaliwal, the nurses (who were wonderful!! ), Jim, Jeff and Heath (yes, I had all my men there helping me) I started pushing as much as my tired, exhausted body could push. After about 10-15 min of pushing I finally felt her push through and then felt the incredible relief that follows. The nurses were supposed to put the Carrigan on me after delivery so I could hold her and tell the guys everything about her. But since they had so recently given me the Nubain, the medication was still in her system and she wasn’t crying as much as they wanted her to. They said that the medication relaxes the baby in the same way it was supposed to relax me. They took her, instead, to the little bed that was waiting for her (in the same room as us) so they could rouse her a little more. I quickly took the phone and explained to Tommy and Jeff what was happening and how beautiful she was. After some time they were able to weigh and measure her and bring her to me so I could give her all the love that her daddies were sending her. I am truly sorry that Tommy and Jeff were not able to be at the delivery. I really tried everything I could, especially denial, to prolong it so that they could be. Even the Dr. Dhaliwal was shocked that she came so soon. She said that she expected Carrigan to be here before my next appointment but not the same night as my appointment that day! I am thankful that the guys were able to be on the phone and at least have that experience. And if Heath ever gets the video to them they can put the sounds they heard with some sights. 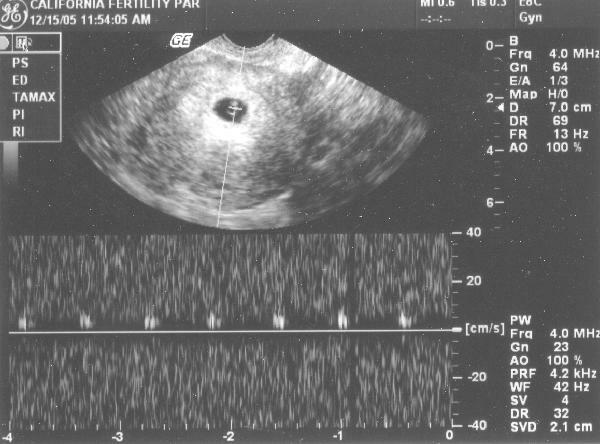 :o)"
Wanted to let everyone know we had a very good ultrasound reading today. We have one healthy little baby growing. We don't like saying "it", so we are calling it our little Bean. So, to our surprise, we were able to hear our Bean's little heartbeat today! The doctor said everything looks perfect. We got several photos of Bean as well. Everyone keep your fingers crossed and your prayers coming that Bean stays happy and healthy and continues to grow so we can all be ready for the August 8th due date. Thank you for all your support through our wonderful process. We will keep you updated as we follow the process.